New Soundabout & Music 8 London SEND Network and Education Training Centre! Soundabout will be running a series of Soundabout Foundation and Optional CPD training workshops across the Music Education Hubs in North London. These CPD workshops have been developed, to support the development of peripatetic teachers, music specialists in SEND school, class teachers and support staff working with pupils and young people with PMLD, SLD and autism. The topics have been chosen in light of feedback from the SEND network members during the Soundabout consultation period that took place in September – December 2018. 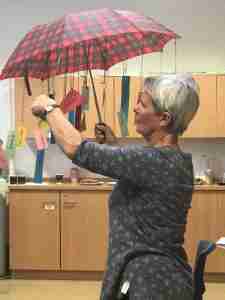 Sue Simmonds, Soundabout Senior Practitioner shares her ‘umbrella of musical opportunities’ during the Soundabout & Music 8 London launch day. See Training timetable for venue details.